Matt Thompson is a senior aquaculture specialist with the Aquarium’s Sustainable Seafood Programs (SSP). 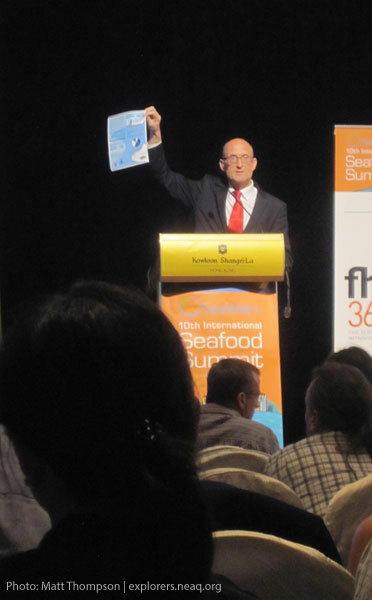 He is going to be blogging from the Seafood Summit in Hong Kong. The Seafood Summit brings all those concerned with sustainable seafood together in a conference to identify challenges and look for solutions. 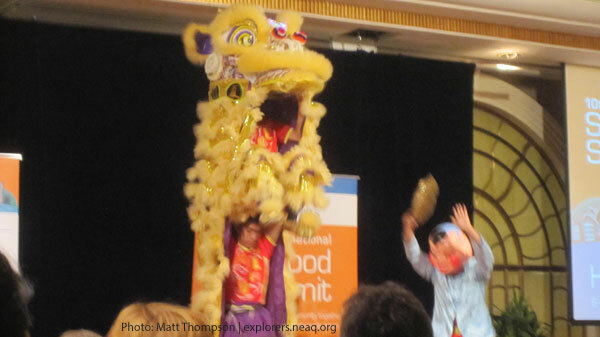 Today’s meetings kicked off in style, with a traditional Chinese lion dance to welcome the Summit attendees. After the show, two Chinese government officials addressed the Summit, including the Director of the Bureau of Fisheries. Their core message, that China had a rich history in terms of fisheries and aquaculture. Chinese aquaculture, they said, began around ~100 BC in China and later published in first ever fish farming manual in 460 BC. In more recent times (1980, so perhaps not that recently), China faced a decision to expand wild harvest fisheries or support aquaculture. They chose to embrace aquaculture, managing to exceed their harvest from wild fisheries with farmed-raised seafood, some 5.3 million metric tons, in as little as eight years! Both officials echoed that China was committed to sustainable fisheries and aquaculture, and that country was ready to work with various groups, including conservation organizations, to meet these conservation goals. Oh, and they also told us to enjoy some good shopping while we were in Hong Kong! Another thought provoking presentation today was given Dr. Stephen Hall (pictured above) of the Worldfish Center, non-governmental organization that aims to reduce poverty and hunger by improving fisheries and aquaculture. Dr. Hall spoke about the difference between seafood demand, being what we want to eat, and seafood need, what people need to survive and be healthy- reminding us of the critical role that aquaculture plays both in food security as well as raising the tilapia and oysters that we see in our supermarkets. Another thought provoking point was that he felt that there was a tendency for organizations to focus their efforts on marine fisheries, with little attention to the freshwater fisheries and aquaculture that produce the lion’s share of the World’s fish. The Aquariums seafood efforts might focus on improving the environmental performance of the seafood we eat in our homes and restaurants, but we do consider both marine and freshwater species. For example, our consumer-facing recommendations include several freshwater species, including tilapia farmed in the U.S., South and Central America. Belize: Things that make you go, "Hmmmmm"
Hong Kong: The Seafood Summit – why Hong Kong?